Recipients of this prestigious award are recognized for their excellence and impact in the fields of first party, third party and subrogation work. Methfessel & Werbel is the first four-time winner. 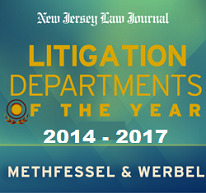 Edison, N.J. – August 29th, 2017 –The New Jersey Law Journal has named Methfessel & Werbel New Jersey’s top insurance law firm of the year, making the firm a four time winner. Methfessel & Werbel is one the longest standing firms and the preeminent insurance law firm in New Jersey. The firm serves clients ranging in size from mono-line program carriers and MGAs to Fortune 500 multi-line carriers and self-insureds. M&W has never strayed from its core mission to serve the needs of the insurance and managed risk industry since its founding in 1972. They have continued to grow to their present size of 46 attorneys, and were most recently recognized by N.J. Biz Magazine as the 39th largest firm in New Jersey. No firm over the past 45 years has had a greater impact on the development of law affecting insurance carriers in New Jersey. Hundreds of cases litigated by Methfessel & Werbel have culminated in written opinions at all levels, including trial and appellate courts and the New Jersey Supreme Court. The firm has participated in cases culminating in over 150 published appellate decisions in state and federal courts, as well as several hundred cases culminating in unpublished decisions. In 2015, M&W represented parties in 10 Appellate Division decisions and two Third Circuit decisions; the firm handled over 30 appeals that year alone. In 2016 the firm represented parties in eight Appellate Division decisions, one Third Circuit decision, and a New Jersey Supreme Court decision directly involving the insurance industry. M&W attorneys have argued many insurance coverage cases before the Supreme Court of New Jersey, including the landmark New Jersey Supreme Court case of Brill v. Guardian Life Insurance Company, which established the standards for the granting of summary judgment. Legal standards affecting the insurance industry, which the firm helped establish, are still relied upon today. For example, 23 years ago, the New Jersey Supreme Court decided Pickett v. Lloyd’s of London. The Supreme Court accepted the argument advanced by the firm that extra-contractual damages should not be available in a dispute over first-party coverage when the insurer’s decision is “fairly debatable.” In February of 2015, the New Jersey Supreme Court reiterated the continued validity of Pickett in Badiali v. New Jersey Manufacturers’ Insurance. Methfessel & Werbel’s most recent New Jersey Supreme Court decision involved an insurance coverage case, Bardis v. Stinson. In April of 2016 the Supreme Court agreed with the firm that the supplemental collapse coverage provision contained in a dwelling policy was unambiguous and did not afford coverage for collapses caused by “hidden” construction defects. Methfessel & Werbel was established in 1972 to serve the needs of the Insurance and Managed Risk Industry. Our team of 46 attorneys and approximately 50 support staff pursues excellence with integrity in its mission to serve our clients every day. To learn more, visit the company’s website at http://njinslaw.com. Click Here for the latest article.